Such amazing strength of spirit. By two young, heartbroken, high school students who survived a deadly horrific trauma. Surprised and terrified by a horrible act of fatal violence in their very own school. Needing to express their overwhelming feelings, two of the drama students wrote this song. Just hours after the tragedy. Turning their heartache, pain, grief, and terror into a beautiful piece of musical art. 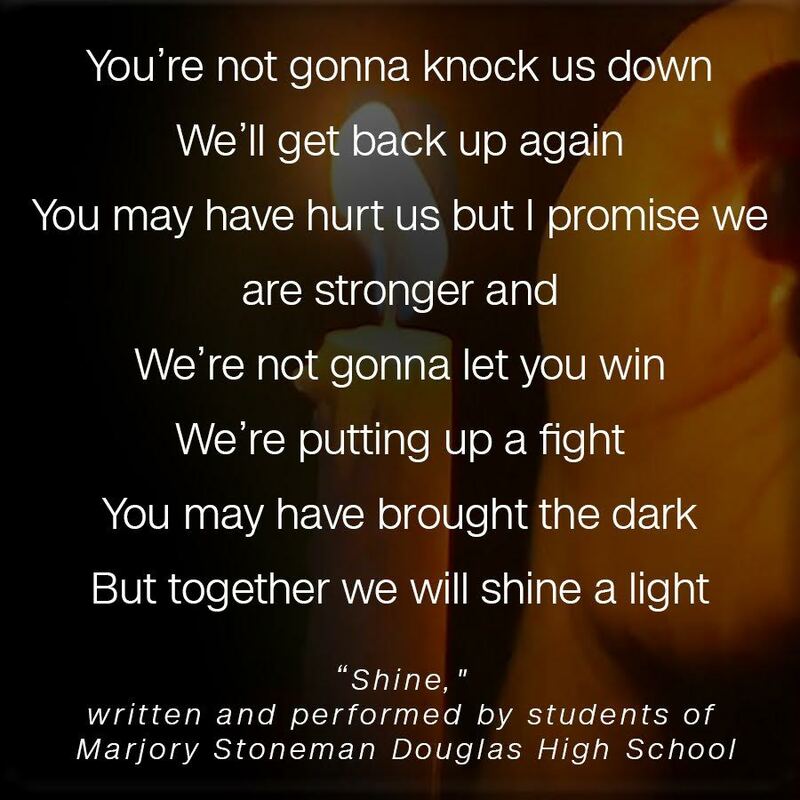 ** Written and performed by Stoneman Douglas HS students, 16-year-old Sawyer Garrity and 15-year-old Andrea Peña a few days after their school endured a mass shooting that killed 17 people. If you have not heard the song, it’s heartbreaking and inspirational. Click here to read more about this tragic incident. What an incredible piece of music! These high school students remind me of the beauty of spirit I see in dissociative trauma survivors. And this tragedy reminds me of how I’ve seen DID survivors rise above the unspeakable horrors that should have never happen. The incident in Parkland, Florida happened quickly, suddenly with an explosion of pain, violence, heartache, grief, and terror. Those students, teachers, families, and community members will be forever changed. Many of those affected will be actively experiencing PTSD and anxiety, and afraid to leave their homes, having nightmares, and flashbacks. And by now, many of these trauma survivors will be overwhelmed in depression and despair. DID survivors know these places of pain very well. DID survivors know what it’s like to be terrified, to be afraid for their lives, to escape with just an inch of life to spare. DID survivors know what it’s like to experience violent injuries, and woundings, and have their bodies attacked without reason. DID survivors know what it’s like to have PTSD, flashbacks, nightmares, crippling fear, and debilitating depression. DID survivors know what it’s like to have their lives changed by someone else’s violent rampages. DID survivors have been in places that exist beyond comprehension for those of us who believe in compassion and kindness, goodness, and love. AND… like Sawyer Garrity and Andrea Peña, you’ve risen above the tragedy, and you’ve learned to shine. You’ve learned how to overcome the evil darkness that tried to destroy you. You have been stronger than those who hurt you. I hope that you listen to this song, a few dozen times. Listen over and over. Maybe even pull out some pen and paper, and write more words of feeling, of expression, of soul-speak. Write, draw, sing, journal what feels true to you. Let all your system join in, especially the ones who sit closest to your trauma, and pain. Listen to the song again. Remember to encourage ALL of your insiders to listen to, and feel, and sit inside the music as well. Claim the inspiration for yourself as well. And to your inside people. You may not have been at that high school, but you’ve been to those places of violence all too many times. And yet…. you still shine. Your DID system shines. Your inside group is totally amazing. You are leaders in life, because you have risen so far above the depths of darkness. You have raised your voices. You have made a difference in this world. And I am so very very very proud to know YOU, because YOU and your incredible DID System are my absolute heroes too. I wish you the very very best in your resilient, shiny, healing journey. Wow what a great song. My heart breaks for kids these days. The world is so broken and so incredibly unfair sometimes. Sure it was back when we were kids too, but it seemed like these types of violent events were so isolated and rare back then. Nowadays kids don’t even stand a chance. It makes me glad i’m not having kids. I hope they find peace and can recover. Its sad but i guess a positive thing for these kids at least that shootings and acts of violence like this are tied with less stigma and shame and are easier to get help for than those which have caused DID in the rest of us. And that 1 event is far far easier to recover from ptsd- wise than years of compounded trauma. But for those kids who experienced this my heart still breaks. What an inspirational post! Thanks so much for sharing this. I really like that the song is plural and talks in terms of WE putting up a fight. WE shining bright. And about being young but being able to make a difference. Definitely resonates with my younger parts and about how we, as a dissociative system, are stronger together than when we are isolated behind dissociative walls. While I am sad that this happened, it also makes me feel less alone in the struggle and hurt and anguish. Many, many,many people suffer and endure really difficult things. Very few people get through life unscathed. And, in that way, we all have a lot in common. Sometimes it’s nice, comforting, and reassuring to know we aren’t that different after all. this reminded me… we used to have an inside kid named Inch. a really small one. Her name was Inch. She didnt talk. She tried to fit in small places to hide. We havent heard from Inch in a really, really long time. Havent even thought about her. Inch is the cutest name EVARRR!!! I hope she’s doing ok inside. we havent saw her in forever . like maybe 30 years. she was a good hider. that was what she did like hide in the closet and hide in the house and hide in the woods. and in this tiny tiny cabinet and grammas house. she probly be hiding still. we got lots of hidden kids. This is a lovely tribute to this senseless tragedy. I’ve read it fir a couple of days and mulled over posting this. I’m thinking that the parallels between what the students experienced, and anything that your readers have may be a bit of a leap. That all individuals likely have pts does not mean their experience was the same in any way. I wouldn’t want a comparison to diminish the importance of either experience. Sorry. I understand your not wanting to diminish either experience, but I don’t think the intent of the article was to compare experiences and make one more significant than the other. Instead,I believe the intent of the article was to find commonality in different experiences. And when we find things we share in common with others, we find hope and support. Hope and inspiration can come from many places and looking for hope and inspiration in others whose experiences are different than mine doesn’t diminish their experience or diminish mine. I shouldn’t limit myself and look only to survivors of things I have endured for my hope and inspiration. I can and will look for hope and inspiration where ever I can find it. I have drawn hope and inspiration from cancer survivors and holocaust survivors and Stoneman Douglas survivors and numerous others whose experiences are vastly different than mine. Because the truth is, what actually happened to me or them on the outside isn’t what matters most. It’s what we all experienced on the inside that is the common experience – the fear, the terror, the betrayals, the devastation, the loss of a sense of safety, the loss of innocence, loss of trust, etc. It is the rebuilding of self after those losses where the common inner experiences of hope, inspiration, strength, determination, kindness, compassion, etc. become most important. Looking to others and finding things shared in common and drawing hope and inspiration from them is an important part of the healing process – regardless of the outer experiences. 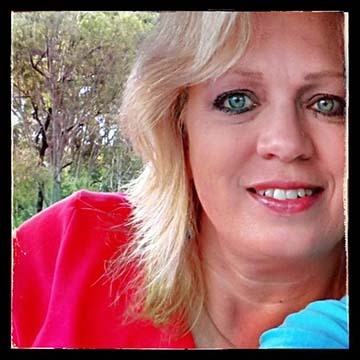 Thank you for this inspiring blog posting Kathy and for all of your comments folks. Indeed, the horror of what happened at Stoneman Douglas HS is unfathomable but sadly we do not hear about the countless violent acts perpetrated on innocent victims every day. Kathy is so right to point this out and to show us that violence is violence and more horrifically so when it is directed at innocent children (shout out to Neo here as well). What Kathy has shone a light on here as well is the courage, resilience, creativity and brilliance of the young people who survived the Stoneman Douglas HS shooting. It is so incredibly inspiring to hear their voices of strength, heart and determination. They are standing up and shining a light on violence that needs to stop and they are leading the way to change. Well dear friends, I think that we have a lot to share in terms of what we have done here at the DD website to shine our light. We have shone a light on child abuse – not just a sympathetic recognition of its existence but the flesh, blood, guts, heart and soul of abuse. We are not a statistic. We are the reality. We have shone a light on Dissociative Identity Disorder. Kathy and Laura have given the compassionate therapeutic reality of DID but we have given it life. Society tries to push DID into the dark corners of their collective shame because they do not want to admit that child violence takes place in front of their blind eyes. We stand up and shout out its reality and shoot a laser light on the pain and human destruction of childhood abuse. DID is real. We are real. We have been brought together by Kathy into this compassionate community of fellow DID folks on a journey of survival and healing. Together we shine our little lights and together we become a wondrous beacon of sharing, understanding, hope and healing. The beams of illumination of our collective heart, resilience and wisdom spreads out in all directions through the DD website and our lives. We are not broken. We can not be extinguished. We are indomitable little lights shining as one. Thank you friends for being such bright lights in my life. We refuse to be ignored by those who will not listen. There are so many things you can do to become involved. Reach out to your congressmen, mail, call and tweet. The smallest of words can make the biggest difference. Be the voice for those who don’t have one. Together we have the power to change the world around us.